Apr. 26, 2013 6:00 a.m. Since the earliest days of homesteading to today one can hear the cry of “Play Ball!” as spring rolls around and local baseball teams take to diamonds located through out Leduc and area. One of the best early teams came from Conjuring Creek. Charles H Stout, Alfred and Darcey Buckell, Irving Ferris, John Blondheim, William Saunders, and the Howard brothers Ernest, Bill, and Charlie made up the first team in 1902. Conjuring Creek was very competitive until the late 1930’s often winning the Glen Park Trophy. Over the years the league consisted of teams from Millet, Fredericksheim, Leduc, Bulford, Clearwater, Calmar, Devon, Ireton, Warburg, and Sunnybrook. One of the best teams to play in the early days was the 1919 to 1922 Conjuring Creek team. During this period the team featured one of the best pitchers ever to play in the area. Sylveanus Augustus (Vean) Gregg was born on April 13, 1885, near Chehalis in Washington Territory. He was a big lefthander who developed his strength as a plaster when he wasn’t working his dad’s farm. After earning a bookkeeping diploma in 1904 he began throwing for amateur teams on the weekends for $25.00 when the Spokane Indians of the Northwestern League discovered him. 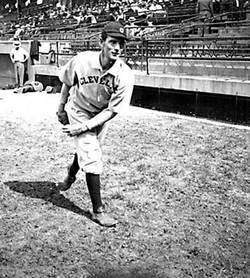 In 1911 Gregg began his career as a major league pitcher when he came out of the bullpen to pitch for the Cleveland Naps (Indians). Three games later he was a starter. Gregg’s prime pitch was his curve ball and he used it to strike out Ty Cobb three times in one game. He became the only twentieth-century pitcher to win at least 20 games in his first three years in the major leagues. Gregg is still Cleveland's career won-lost percentage leader with a record of 72 wins and 36 losses. In the early days of baseball it was common for pitchers to pitch the entire game including extra innings. Averaging over 260 innings during his first three years Vean began to suffer from a “dead” arm. Gregg would experience recurring arm pain for the rest of his career. At times his arm felt fine and he was a very, very good pitcher. However when his arm went bad he would rarely pitch. In 1914 Gregg was traded to the Boston Red Sox and was part of the 1915 & 1916 World Series Championships. So how did this major leaguer end up pitching for Conjuring Creek? The 1918 season had been cut short due to World War I and at 33 Gregg who was too old to serve decided to come to Alberta and work the ranch he had bought in 1912. His brother had married a Sangster who had family in the Conjuring Creek area. Gregg seemed happy working his ranch and pitching for the local community. The team was very competitive, partly due to Gregg’s pitching and even after he left the team would continue to be successful into the late 1930’s. In 1921 crop prices dropped out of sight and Gregg decided to get back into baseball to help pay his farming debts. He returned to the west coast and played with the Seattle Indians in the Pacific Coast League. An interesting side note was that in 1924 the league gave Gregg the right to use the Spitball. Being able to use the spitball would extend his career. Gregg was quoted as saying he wanted to play two more years to clear his farm debts and allow him to equip and fit the farm for the rest of his life. However, when Clark Griffith ponied up $10,000 and three players to acquire Gregg he abandoned his dream of returning to Alberta. So in 1925, at the age of forty, he appeared in 26 games winning 2 and losing 2 with 2 saves for the Washington Senators which lost to the Pittsburgh Pirates in the World Series. This would be Gregg’s last year at the major league level. Gregg returned to pitch in Washington for various semi-pro teams until 1931 while running a gas station in Spokane and then a store he called The Home Plate in Hoquiam, Washington. Gregg passed away in 1964 at the age of 79. The Cleveland fans, in 1969, voted Vean Gregg as the greatest left-handed pitcher in Indians history. Today the Powerline Baseball league carries on the long tradition of baseball and the Leduc Milleteers join Ryley, Armena, Bardo, Holden, Camrose, and Beaumont in providing local fans with glimpses of what it was like when Vean Gregg took to the mound and played ball!